← …and the groom wore Converse trainers…..
About this time of year all the summer bedding is slowly shrinking back. I look at my baskets and planters and although I know they’re getting well past it I resist the urge to empty them onto the compost heap on the off chance that they’ll just carry on a bit longer and that I can keep the autumn at bay. It’s no good of course, it has to be done, and once I’ve bitten the bullet and cleared away the old exhausted plants so I can get on with some autumn planting actually it all starts to feel a whole lot better. If you want to set about it yourself there’s plenty out there in the nurseries and creating a pretty or stylish display isn’t difficult. The violas above are just massed into a small trough and they’ll carry on all winter long…they might come and go a bit if we have snow but they’ll soon spring back up once it clears away and they’ll carry on till the spring. 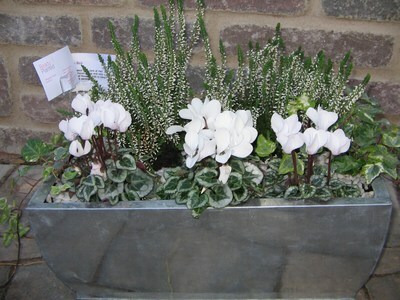 Variations on a theme here – above are white cyclamen with white heather and ivy in a trough topped with white gravel and below the same combination of plants but using pink cyclamen and pale lilac heather….the flowers on the cyclamen will be knocked down by a frost but they are one of the most stylish looks for this time of year and after flowering can be planted in the borders under hedges to come again another year. and you can ring the changes by adding ornamental cabbages to your planting. 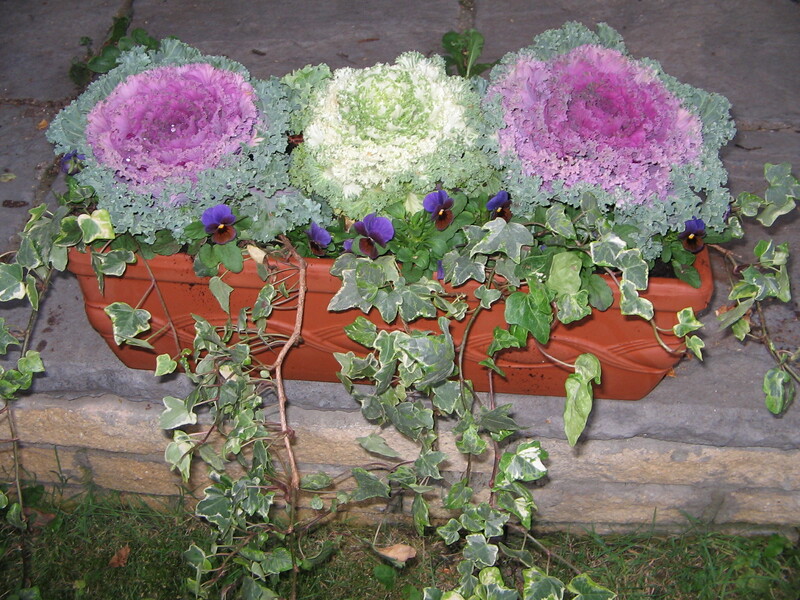 This is a teraccotta trough, just from the local DIY store with 3 ornamental cabbages and more ivy, with some little violas tucked in between. If you’re thinking they’ll be a nuisance to look after planters at this time of the year don’t need as much attention or watering as in the summer but do still make sure they are damp because the weather can surprise us all and suddenly we have a hot sunny day. Deadheading pansies and violas always helps to keep new flowers coming, and if we do get a frost and you want to keep your flowers for longer you can just chuck a piece of newspaper or horticultural fleece over the planters for the night to break the frost. I love putting planters together – you can get really creative if you look at what’s available and put together some planting scheme based on colour and shape and over the next couple of weeks there’ll be much revamping of my clients troughs and boxes so they’re smartened up for the winter. 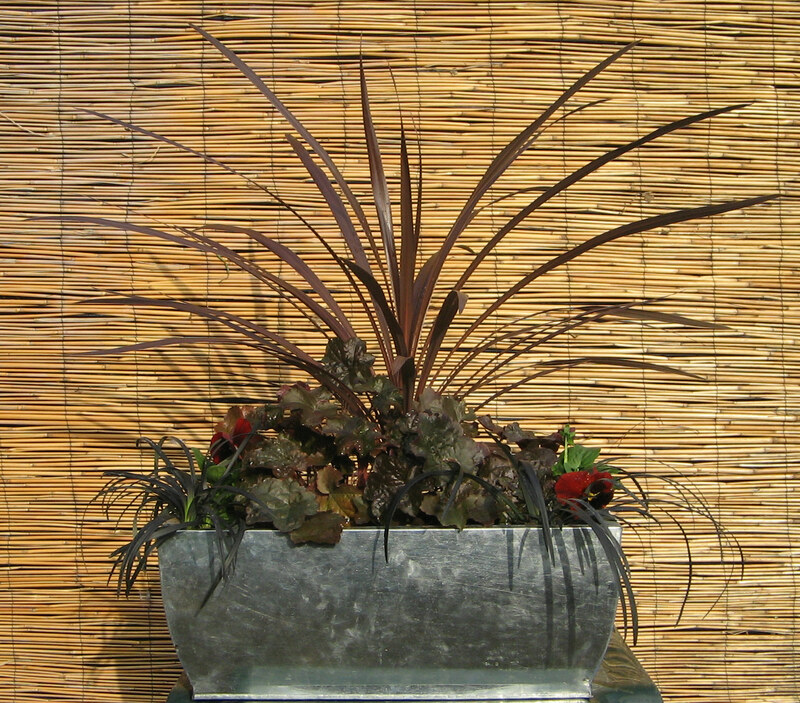 I called this last one the chocolate box because all the planting was chocolate coloured – and if you put it together as a gift it’s good to tuck a couple of wrapped chocolates in amongst the foliage – but make sure it’s clear or they may go unnoticed until it’s too late to eat them. In this box is a red cordyline, heuchera, dark coloured pansies and black grass(ophiopogon nigrescens) and everything should be readily available now. All the plants should last the winter very well, the flowers on the pansies will come and go with the weather and the cordyline would appreciate a little shelter, especially from winds but otherwise they should be fine….and next spring you could reuse and revamp the planting because all the plants except the pansies are perennials. 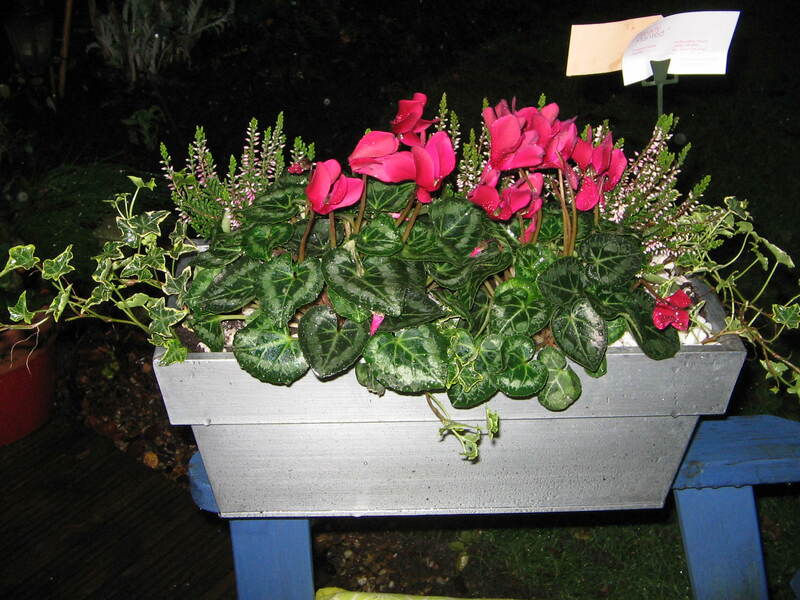 Its a lovely morning this morning so a good day to have a go at a planter and cheer up your doorstep or patio….and if I can help with any questions you can always tweet them to me @MaggyAnne.